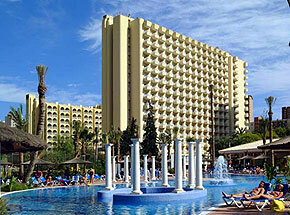 The Hotel Sol Ocas is located just 300 yards from Levante Beach. Holidaymakers can relax in one of the many pools and various sports workshops and entertainment while enjoying their stay at the Hotel Sol Ocas. All your meals are taken from the buffet and snacks are available from bar. You have the use of 5 swimming pools (2 in Sol Ocas Hotel and 3 in Sol Pelicanos Hotel) 2 poolside bars, gardens, sun terraces and sunbeds. We a party of 6 booked the Los Ocas Pelicanos on the strength of having stayed there on three previous stays in Benidorm. It was a 4 day break to celebrate our son's 21st birthday again every thing was spot on very polite helpful staff rooms immaculate heating in the rooms as it got very cold at night food very good great choice. On my sons birthday the management sent a bottle of champagne to his room to wish him happy birthday a very nice gesture as they only found out off the cleaning staff after they had seen all the banners on his door. All-in all a great time at a very good hotel. We went to Benidorm because my children (17 and 15) wanted a livelier holiday than usual. I was dreading it. It turned out to be nothing like we expected. The resort was lively with plenty to do but without the British larger louts I was expecting. In fact walking around in the evening the place was crowded with Spanish families. What I thought was going to be Blackpool in the sun turned out to be quite a smart cosmopolitan resort obviously popular with the Spanish. The hotel was very pleasant. Not in a fantastic position, about 200m from the sea front behind what looked like an area where a hotel had been demolished but close enough to walk to the beach or promenade within a couple of minutes. The room was average, as a single parent with two children I am used to being palmed off with a twin or double bedded room with a camp bed in it. No exception here. The food was the usual AI choice and quality. The highlight of the hotel was the pool area which was both large and beautifully presented. A girl bouncer guarded the entrance all day. The bad part was she stopped you taking in your own drinks and food (put them in your bag), the good part was she removed the unattended towels at 9:00 which meant if you were down by 10 you got a sun bed and could laugh at the people who came down at 12 expecting their towels left at dawn to still be there. "Entertainment Team At The Time, Was So Professional"
I would rate the Sol Pelecanos/Ocas 9 out of 10, I think that the only thing letting it down at the moment is the entertainment. Me and my family stayed there about five years ago, and at that time, the entertainment, was the best I have seen in a hotel, the entertainment team at the time, was so professional, and I was very impressed. We recently returned, and the hotel was just as good as the first time, very clean, the food was lovely, with plenty to choose from, but we found the entertainment very disappointing this time, but I would still recommend this hotel for anyone going to Benidorm.